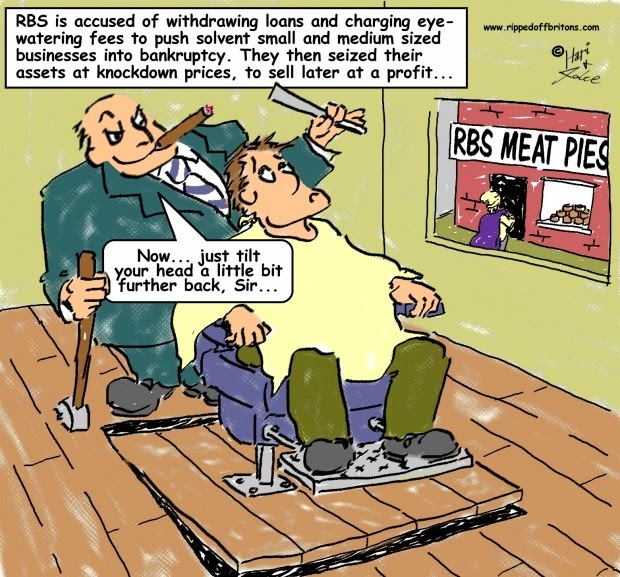 Privatisation of RBS, will the taxpayer get their money back let alone make a profit? Osborne says yes, National Audit Office says no! On the 20th May 2015, just weeks after the General Election relieved the Tories of their Liberal Democrat conscience, George Osborne asked the bankers at Rothschild’s to tell him that he should re-privatise RBS (the Royal Bank of Scotland). "The Report has been prepared on the basis of publicly available information. This information has not been independently verified by Rothschild....no responsibility or liability is or will be accepted by Rothschild or by any of their officers, servants, agents or affiliates as to or in relation to the accuracy or completeness of the information forming the basis of this Report"
In short, Rothschild's stated: we took the information we were given; we didn't check whether it was correct; we didn't check whether it was complete; don't blame us if it is wrong. The report managed to assert that we, the British taxpayers, not only get our money back but we make a £14.3 billion profit! The report concedes that we made a loss from RBS alone, estimated at £7.2 billion. But taking into account all the financial sector crash rescues together: RBS, Lloyds, UKAR (i.e. the remains of Northern Rock and Bradford & Bingley) and various other unspecified institutions the report claims an overall surplus of £14.3 billion. To see if this is true, we took a look at publicly available information from the National Audit Office (NAO). 1) "Cash and fees received"
What's this about? 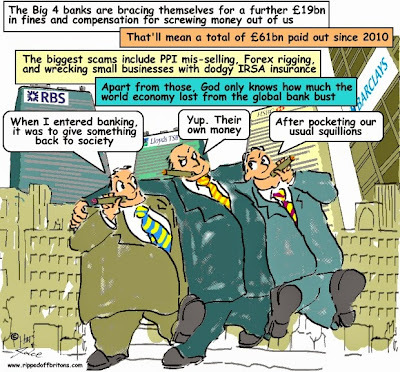 The banks bought £1.029 trillion (equal to 80% of all publicly owned wealth put together: £1.34 trillion in 2013-14) of insurance cover from the government to protect them against further losses. This insurance came mainly in the form of the Credit Guarantee Scheme, the Special Liquidity Scheme, and the Asset Protection Scheme. The banks didn't claim on this insurance, so Rothschild's decided they would use the premium to put against the amount the banks owed the government. You try going to your insurer and see what they say if you ask for your premiums back because you didn't make a claim. And you want the money to pay off your overdraft. Also included in this "cash received" is interest paid by the banks on £133 billion in loans the government gave them. (This £133 billion is not included in the "Amount Injected" figures in the table above). [Text in purple and red below is taken from the National Audit Office]. 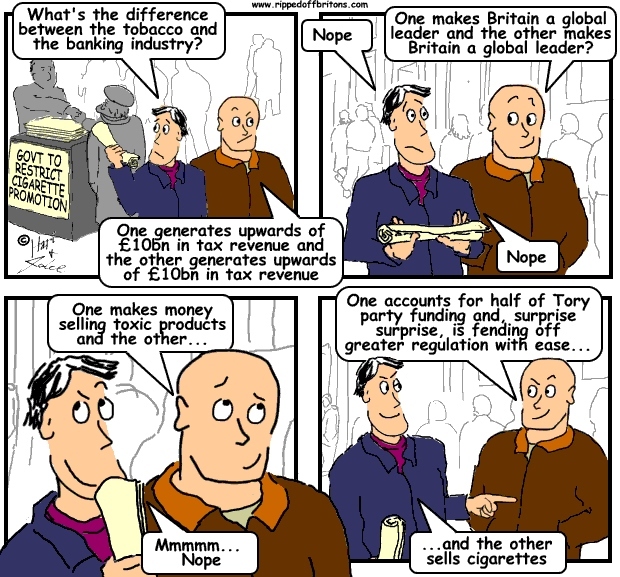 Q: How much support did the Government provide to UK banks? The fees and income received. As at 31 March 2014, the Treasury had received a total of around £17 billion in fees and interest for providing the support and assuming the risks covered by the guarantees since 2008. This is below the cumulative finance cost. Shaded in green in the Rothschild's table above, "Outstanding Payment" refers to £20.3 billion still owed by the banks to the government. For example RBS owed £1.2 billion to buy back the government's right to the lion's share of dividends, their "Dividend Access Share". Something RBS is keen to do so it can restart paying dividends, which haven't been paid since its rescue by the government. Rothschild's assumes this £20.3 billion will all be payed back. Taken literally one can't argue with this. If the banks decide they don't have the money, then the taxpayers will bail them out. The taxpayer picking up these banks' debts to the taxpayer would actually be relatively small beer in the grand scale of things the taxpayer has been picking up for the financial sector. Something Rothschild's have completely omitted is the government had to borrow the money used to bail out the banks. Odd that bankers never forget about the interest when we borrow from them, but it completely slips their minds when they borrow from us. "Costs arising from the additional government borrowing raised to finance the purchase of the shares and loans.. The money needed to make the interventions was provided by longer-term funding in the form of Gilts (interest-bearing government bonds purchased by investors for periods of up to 50 years), at a cost of just under 3% a year." The Opportunity Cost represents what may have been gained if the government used the money given to bailout the banks on something else. "The income generated by fees and interest is less than would be expected from a normal market investment and has not compensated the taxpayer for the degree of risk accepted by taxpayers in providing the support. Once the opportunity cost and risks are factored in, the schemes have represented a transfer from taxpayers to the financial sector." It is ironic that the chancellor asked the bankers at N.M.Rothschild's to advise him. About 200 years ago an earlier head of the bank, a chap called N.M.Rothschild, said "Buy when there is blood in the streets". His meaning was to buy cheap when everyone else is panicking, so you can sell at a healthy profit later when everyone has calmed down. Instead, Osborne has decided to sell RBS at a loss. It is clear from the National Audit Office that the UK Taxpayer has made a large loss on the bailouts overall. It was perhaps inevitable that the big winners from the banking crash would be the banking sector. RBS, we are told, will thrive under private ownership because it will be able to do things it can't do under public ownership. We shudder to think what those things are, having already experienced Payment Protection Insurance, Interest Rate Swap Agreements, and various other scams pulled off by privately held banks in recent years. And so here we are again. The taxpayers, having rescued and sheltered the collapsed banks, now release them back into the wild private sector, where we can continue to be their victims in the various shenanigans that are known collectively as "banking". Sadly there is nothing much we can do about that. But one thing we can do: when they tell you we British taxpayers made a profit from the banking bailouts take advice not from Rothschild's report but from Tom the cartoon cat: "Don't you believe it!" The Asset Protection Scheme payments of £5bn where made to the government and the banks never made a claim. Hence that is a £5bn profit to the government. Likewise the SpecialLiquidity scheme made a profit of £2bn after all costs. The US government has made about $50 billion in profits from bailing out their banks and insurance companies. That's a lot of money for US taxpayers. "The fees and income received. As at 31 March 2014, the Treasury had received a total of around £17 billion in fees and interest for providing the support and assuming the risks covered by the guarantees since 2008. This is below the cumulative finance cost." b) The NAO also refers to the "Opportunity Cost". This is what could have been gained if the rescue hadn't been necessary. It's not about whether the rescue was necessary. The financial sector screwed up sufficiently abysmally to make it necessary. For example, if the government used the money to build houses instead of bailing out banks, then there would be a profit both socially and economically. "The first section estimates the gap between a counterfactual. what gross domestic product (GDP) would have been had the financial crisis never occurred. and realized GDP. Our estimated cost of the crisis is 40 to 90 percent of 2007 output ($6 trillion to $14 trillion in 2012 dollars), depending on assumptions about the trend rate of growth that would have held if not for the financial crisis and the possibility of a mild, oil-related downturn even absent the crisis. Our calculation is a conservative estimate of the aggregate cost of the crisis that covers 2008 to 2023, the year output is assumed to have fully returned to trend." (b) can be much larger than (a). The actual loss to the British taxpayer of bailing out the banks is actually much smaller than the loss of output from the crippled economy. Andrew Haldane, a director of the Bank of England, said of the loss in economic output resulting from the banking crash: "Put in money terms, that is an output loss equivalent to between $60 trillion and $200 trillion for the world economy and between £1.8 trillion and £7.4 trillion for the UK."